In 2012, the University of Warwick was one of 60 locations chosen by the Woodland Trust for the site of a “Diamond Wood” to celebrate the Queen’s Diamond Jubilee. These woods are all open to the public and offer a chance to enjoy the natural environment; to walk along the paths and to play and picnic in the glades that have been created. Here, land previously used for agriculture has been planted with 24,000 native broadleaved trees. The University of Warwick has worked with the Woodland Trust to ensure that this new wood will encourage biodiversity: the widest possible range of eco systems on this site. A new sculpture was commissioned for this site to mark the 50th anniversary of the University of Warwick in 2015. Called Habitat, the sculpture offers a perch for birds and a hiding place for insects. Slits have been cut into the upper area to provide a home for bats. It is carved from an ancient cedar tree that fell during a storm at Portmeirion in North Wales. The artist has remained faithful to the original, natural shape of the tree and it is possible to see where the branches would have been. Habitat has been made by David Nash who works worldwide with wood, trees and the natural environment. Near his home in Wales he has planted a hillside with trees that are grouped and coppiced to become sculptural forms. In 1996 David Nash worked on the University of Warwick campus to make sculptures from oak, beech and alder. David Nash is concerned to make sculptures that respond to the material from which they are made and to the site where they will be placed. Interested in our plans for bio-diversity on this site, he has created a sculpture that invites the natural world to occupy his work. He said when he visited the site, the exact place chose itself, near a big oak tree and a small pond, and at the entrance to the wood with mown paths cut through it. Currently, the sculpture towers over the young woodland but as the trees grow, they in turn will be taller than the sculpture. The sculpture can be found at Grid Reference SP295742. The postcode is CV8 2JU. 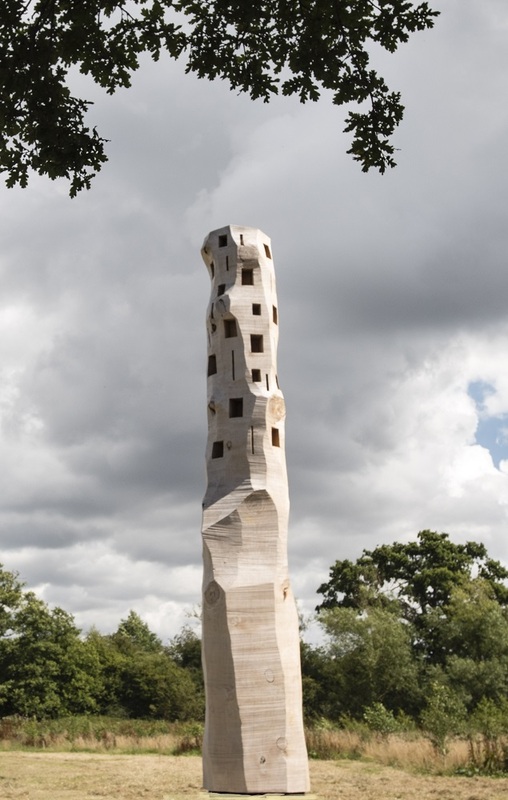 The sculpture lies in the valley, at the foot of the hill that climbs towards Kenilworth.